It’s Spring in Seattle and the weather is changing. I think. Being born and raised in this beautiful city, a conversation constant is the irrational and moody temperament of our climate. Somedays you’re up, somedays you’re down. Rain, sun, wind, we have them all, everyday, which provides a great opportunity to become completely engrossed in the moment. If you ride your bike to work, you know this to be true as the ride home may be a struggle against hail, wind and rain, or maybe it’s an epic sunset ride. Either way, you can’t escape the moment by moment evolution. This brings me full circle to Spring time in Seattle. If you’ve hit a farmers market lately you may have noticed the colors and the produce change with the season. No longer are we buying hearty root vegetables, grown underground and protected by the soil, but now sunlight induced blooms of asparagus, fava beans and rhubarb have begun to infiltrate the market. And now my kitchen. Asparagus is a lovely ingredient that can carry a dish or be a great supporter. This afternoon’s preparation is minimal, as I heat up my cast iron grill pan. If you don’t own one of these pans, I highly suggest you go out right now and purchase one. Otherwise, turn on the broiler and grab a cookie sheet. Heat pan to med/high (or set oven to broil). Drizzle asparagus with extra virgin olive oil, salt and freshly cracked pepper. Grill for about 5 minutes, shake pan gently or flip asparagus so charred markings occur on multiple sides, then finish cooking for another 5ish minutes. The size and thickness will alter your cooking time, so take notice. 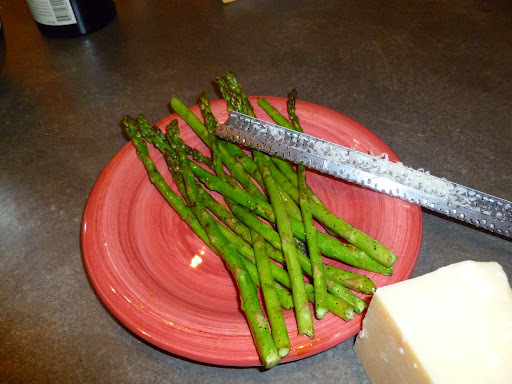 Once asparagus is bright green and charred, remove from the pan onto a plate and sprinkle with a light dusting of freshly grated Parmesan cheese. Perfection.